The Oldest Son and I kept tradition alive with the Annual One-Day Tioga/Sonora Pass Tour last week and found a few Sierra Nevada rivers and streams running a bit too high for easy fishing, despite the lack of snow this year. This excursion — passing through Yosemite’s high country and over two passes exceeding 9,000 feet — was marked this year by a deliberate slowing down. As always, the plan was to fish along the way. This time, however, there was an acceptance that fish would be there, or not, when we arrived. Perhaps it’s maturity. Perhaps overconfidence in my abilities. Whatever the case, it would open our eyes to new sights and new fishing possibilities. 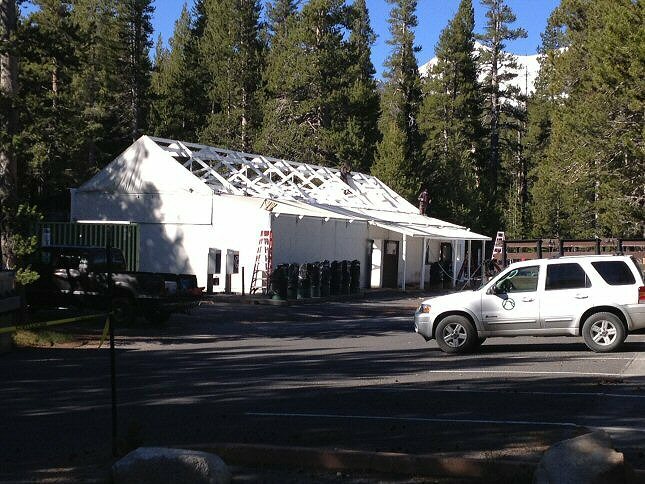 The Tuolumne Meadows general store being assembled for the season. We left the Family Cabin later than usual but quickly covered our longest continuous stretch of driving before arriving at Yosemite’s Big Oak Flat entrance station. Less than an hour later we pulled into the Tuolumne Meadows campground parking lot. A crew was stretching canvas over the wood frame of the campground’s general store. The meadows were already exposed and beginning to brown. The upside: it’ll probably be a relatively light mosquito season. But if you have any inclination to fish high-country streams or rivers, the season will be about a month head this year. Don’t be fooled; it was still cold. We wadered up and spooked a few trout in one river, wrongly thinking that they had forgotten about fisherman during the winter. 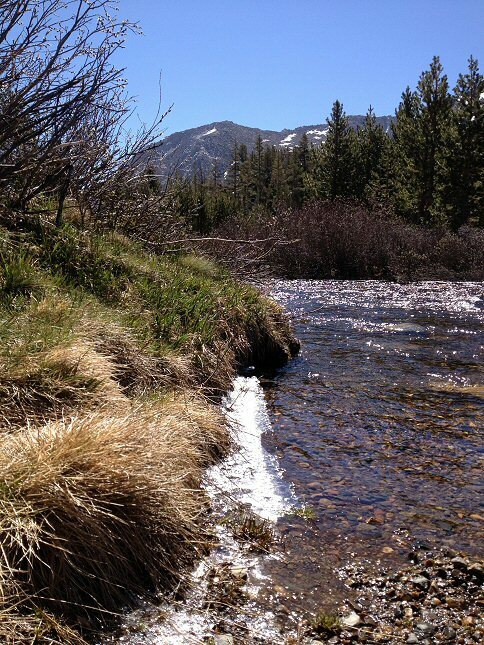 We explored a few other streams just past Tioga Pass. Reading a roadside monument, I learned of Bennettville, a mining town that never produced ore during its existence from the 1870s through 1933. 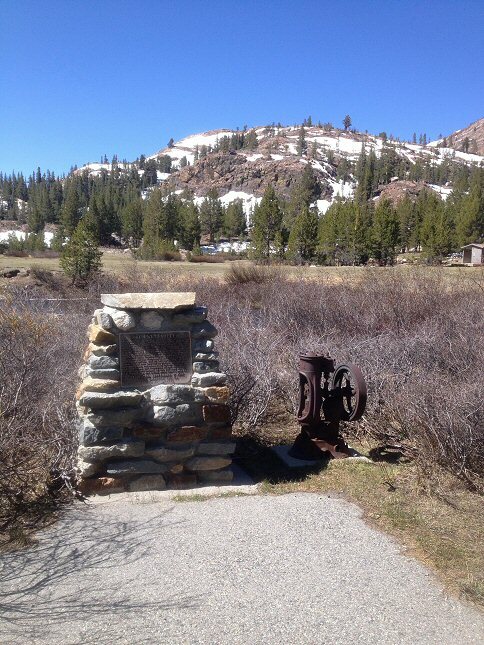 It did, however, give birth to the Great Sierra Wagon Road, which later became Hwy 120 and the Tioga Pass Road. The Tuolumne River, with Sean in the far background. The morning spent, we headed down to the Tioga Gas Mart and after picking up a few bottles of Mammoth Brewing beer, stopped for a barbecue lunch. A few more miles behind us, we stopped on the bridge over the Little Walker River. I judged it just on the verge of being fishable and expected Molybdenite Creek, which feeds into the Little Walker, to be in similar shape and worth the time to show Sean this favorite place for the first time. Disappointed to find two other fisherman, we hiked around them before dropping down to the creek. The Bennettville Marker near Saddlebag Creek. The town is about a mile west. My favorite spots on this creek are pools usually created by piles of brush or the ledge of a small waterfall. Eventually, I hooked a couple of wild fish, lost most on dry flies that were just a bit too big, but finally landed a nice brook trout. Downstream, Sean also hooked a nice brookie. We worked our way downstream, exploring the confluence of the two creeks, then began the return upstream, revisiting suspect water. Sean landed another brook trout from the pool I had fished. The other fisherman had left, leaving upstream water open. Through a thick stand of pines and aspen I found a curve in the creek that created a pool and nice looking tailout. Trees crowding the edge of the creek limited casting to short casts parallel to the stream. Reaching the tailout required letting a fly drift under an overhanging log. But it was too good to pass up. A few drifts netted a decent brook trout. Once my focus was off the tail out, a small pod of fish working at the head of the pool came into focus. It was pretty clear they were stocked trout, and while their domesticated appetite might not present a huge challenge, their position did, requiring casting from a crouched position and underneath an overhanging birch branch. Sean joined me later, and despite losing three or flies between the two of us, it was a fun casting and fighting fish in close quarters. On the way toward Sonora Pass, we skipped the raging West Walker in favor of the upper North Fork of the Tuolumne, on the west slope. There we’d find stock rainbows willing to hit stimulators well into the evening. In the end, we fished places unfamiliar and usually unfishable this time of year. Ice along the Tuolumne River. 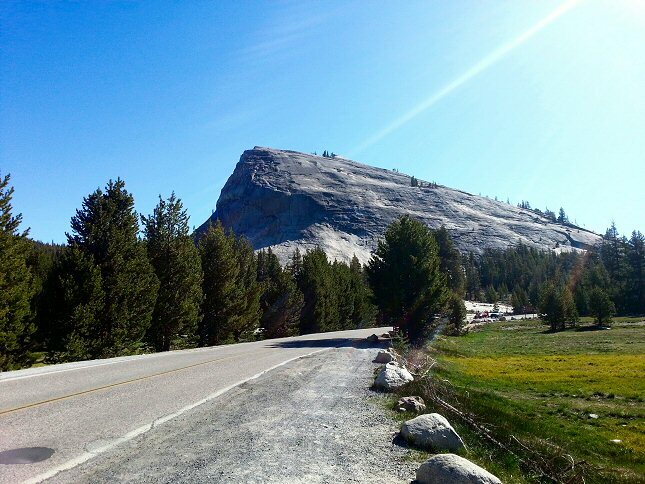 Our old friend, Lembert Dome. 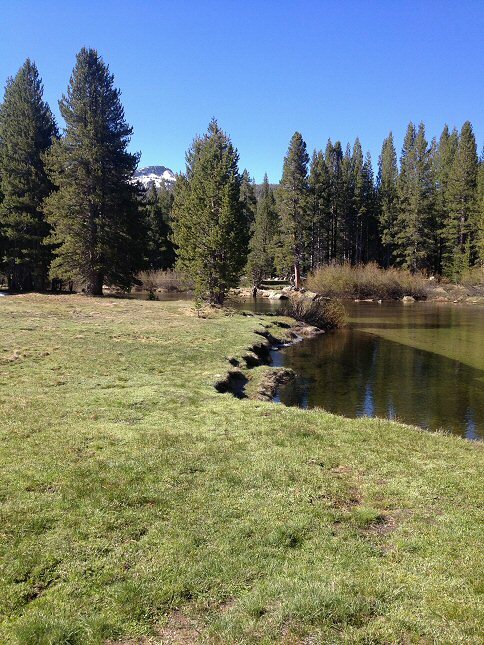 Categories: Brook Trout, California, Casting, Eastern Sierra, Family, Fishing, Fly Fishing, Hiking, Lembert Dome, Rainbow Trout, Sean, Sierra Nevada, Trout, Tuolumne Meadows, Tuolumne River, Twain Harte, Vacation & Travel, Yosemite | Permalink. This certainly looks like a great place to spend time exploring…beautiful water. Beautiful country up there and it’s always nice to catch a fish or two.